Pearson, Simon & Warshaw, LLP is committed to seeking justice for individuals and groups who have been wronged by big corporations, employers, banks and insurance companies. 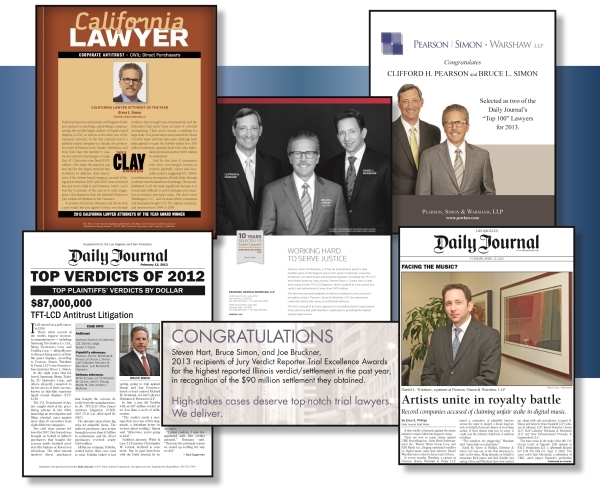 Pearson, Simon & Warshaw, LLP is a nationally recognized law firm with offices in Los Angeles, Minneapolis and San Francisco, representing clients throughout California and the United States in state and federal courts. Our proven litigators thrive in all types of challenging cases, including class actions, antitrust cases, business and securities litigation, consumer and employment cases. PSW has the experience necessary to handle difficult and complicated litigation. Our attorneys have proven time and time again that they are formidable, focused and thoroughly prepared to take on the most complex legal disputes. LCD Displays — Pearson, Simon & Warshaw, LLP served as co-lead counsel in this multidistrict litigation arising from the price-fixing of TFT-LCD panels. After going to trial against Toshiba Corporation and its related entities and obtaining a jury verdict of $87 million before trebling, PSW settled with the remaining defendants to bring the total to $473 million in settlements. Potash — Pearson, Simon & Warshaw partner Bruce L. Simon served as interim co-lead counsel for the plaintiffs in this multidistrict litigation arising from the price-fixing of potash sold in the United States. The case resulted in a significant 8-0 decision from an en banc panel of the Seventh Circuit Court of Appeals and a $90 million settlement on behalf of the direct purchaser plaintiffs. Credit Default Swaps — Pearson, Simon & Warshaw, LLP has been appointed as co-lead counsel in a multidistrict class action arising from antitrust violations in the trading market for credit default swaps (CDS). The case alleges that some of the largest banks and financial institutions in the world conspired to restrain trade and eliminate competition in the CDS market in order to artificially inflate and maintain the transaction costs of CDS trading. We recently achieved a landmark $1.864 billion antitrust settlement in the case. On October 29, 2015, Judge Denise Cote of United States District Court for the Southern District of New York granted preliminary approval of the settlement. Lithium Ion Batteries — Pearson, Simon & Warshaw, LLP currently serves as interim co-lead counsel for direct purchaser plaintiffs in a multidistrict class action arising from the price-fixing of lithium ion batteries, which are used in everything from cellular phones to cameras, laptops and tablet computers. CytoSport Muscle Milk — Pearson, Simon & Warshaw, LLP attorneys are serving as class counsel on behalf of a nationwide class of consumers who allege that CytoSport's popular protein powders, ready to drink protein beverages and other "supplement" products contain elevated amounts of lead in violation of consumer protection laws. Audi and Volkswagen Timing Belts — Pearson, Simon & Warshaw, LLP obtained a nationwide class settlement offering 100 cents on the dollar in this action alleging that Audi and Volkswagen branded vehicles equipped with a 1.8 liter turbo-charged engine suffered from premature timing belt failures. Want to report a fraud? Do you qualify as a member of pending class action? Contact us online or call us toll-free at (877) 391-8300 to discuss any current or potential case.